(Bloomberg) -- Concord Resources Ltd.’s profit doubled last year as the metals trading startup benefited from the turmoil in aluminum and alumina markets following sanctions on Russian producer United Co. Rusal. Concord, which was founded in 2015 by a group of former Noble Group Ltd. traders with private equity backing, saw net income rise to $43.4 million last year. 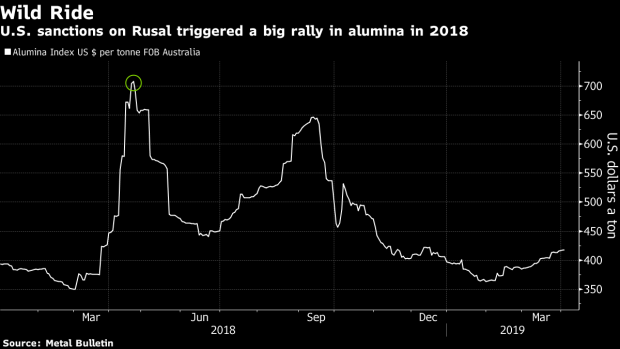 After the U.S. sanctioned Rusal in April, alumina prices doubled to a peak of more than $700 a ton within a few weeks. Concord has a long-term contract to buy alumina from a plant in Louisiana, and last year bought a stake in the parent company of the plant, New Day Aluminum Holdings LLC. While the company benefited from the wild ride in the aluminum market, other commodities traders and miners were hurt. Glencore Plc was wrong-footed by the move in alumina, and Rio Tinto Group also suffered. After three years of strong expansion, Hansen said the metals trader’s growth will moderate in 2019, with fewer trading opportunities as the aluminum and alumina market stabilize following the removal of sanctions on Rusal. The CEO said the company is exploring ways to reward its early backers -- which include Pinnacle Asset Management LP, Pala Investments AG, MKS PAMP Group and the partners of Ospraie Management LLC-- potentially via a dividend or a share buyback later this year. It’s also working on raising more capital and expanding its shareholder base. While Concord has had informal discussions with banks about a potential initial public offering as soon as next year, Hansen indicated the focus for now is on raising funds via private deals. “We are pursuing a plan to raise fresh capital and reward our existing holders after meeting our three-year goals, perhaps after the spring,” he said.